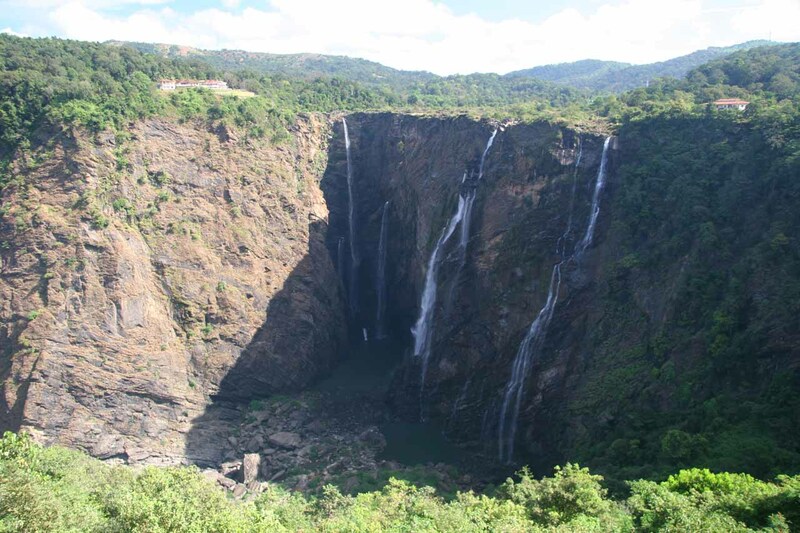 Jog Falls was perhaps India‘s most famous waterfall. 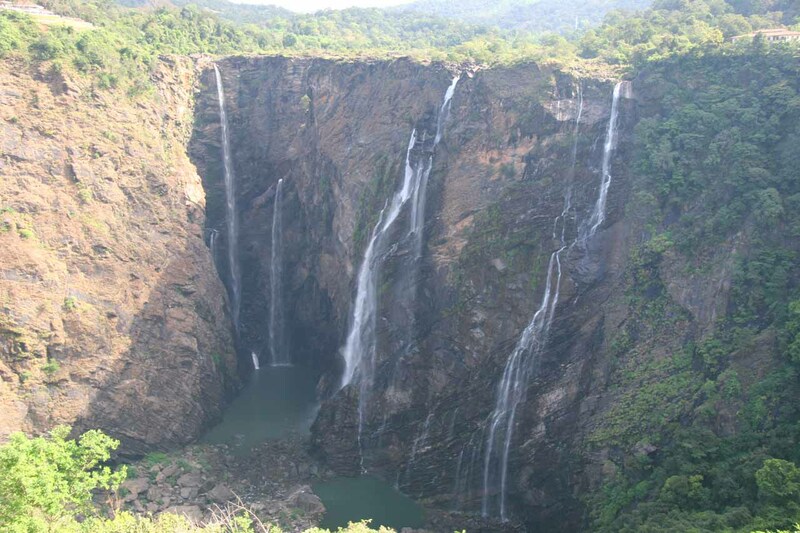 It could’ve easily been the most spectacular waterfall in all of Asia as the massive Sharavathi River spilled some 253m in almost total freefall across its span. 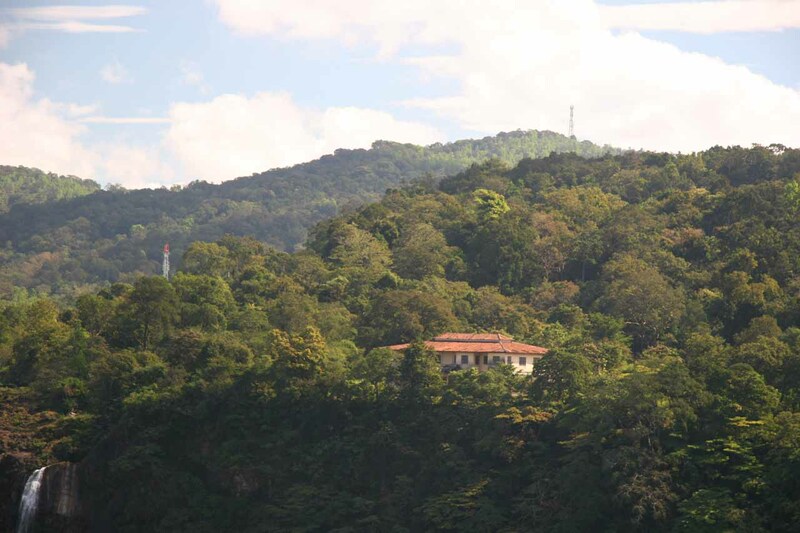 However, as you can see from the photographs on this page, Julie and I saw it in a compromised state due to the Linganmakki Dam further upstream. 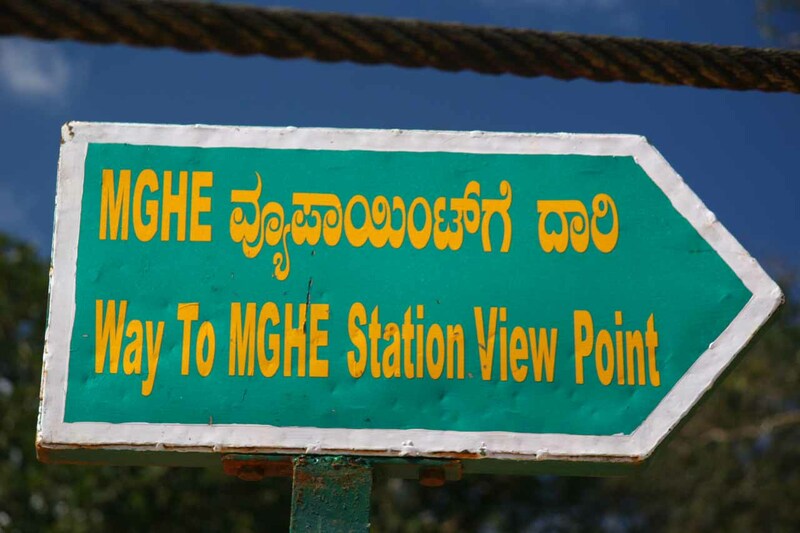 The dam was said to be in use since 1949 and very important in the generation of electricity in the state of Karnataka [pronounced kar-NAH-tuh-kuh]. 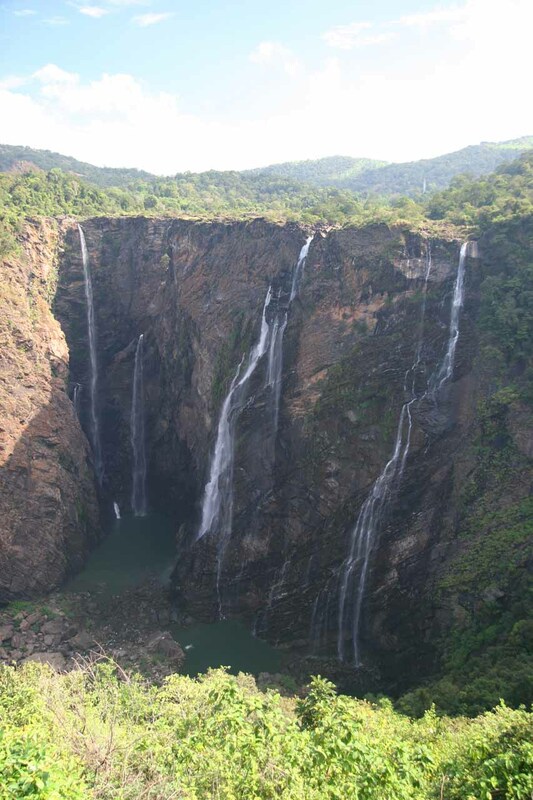 Given our understanding that the hydro scheme had essentially robbed some of the natural flow of the falls, we believe that Jog Falls was pretty much limited to a monsoon-only phenomenon. 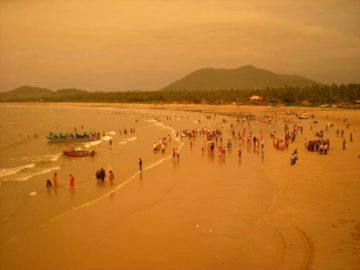 The monsoon (which were characterized by sustained thunderstorms and tropical downpours) would typically occur during the Indian Summer from June through August and maybe September. 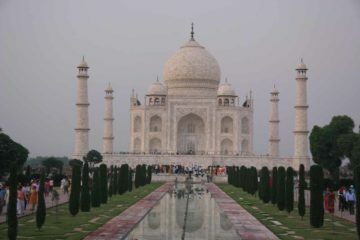 Our visit came right after the end of the monsoon in November, and it wasn’t nearly as impressive as we had hoped (though it was still impressive). Perhaps the unusually late and weak monsoon preceding our visit in November 2009 also didn’t help matters. 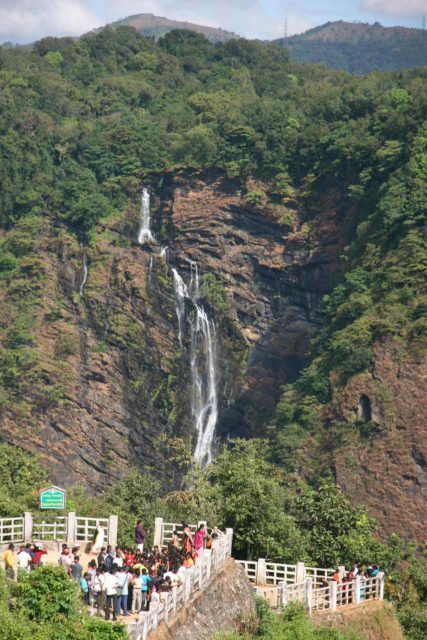 Thus, the bare walls you see in the photos on this page attested to the potential grandeur of the falls if seen during the monsoon. 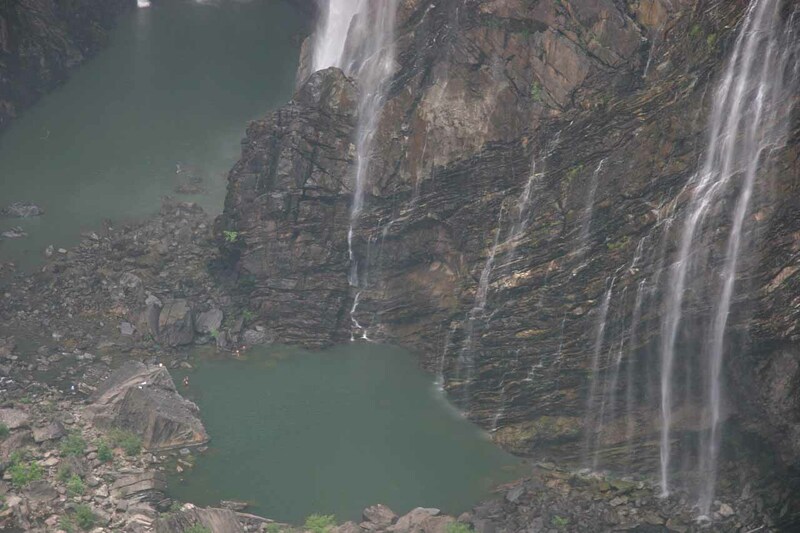 In terms of the behavior and impression of the falls, I can think of the way Barron Falls in Australia on the Kuranda Scenic Railway behaved just outside the Wet Season thanks to a hydroelectric facility just upstream from it. Another example that we could think of regarding the behavior of Jog Falls was the Voringsfossen waterfall in Norway where we witnessed a cluster of segmented waterfalls falling into the same ravine. The one thing about the low-flow state of the falls was that we were able to see its main segments distinctly, and each one had a name. The names of the constituent parts (from left to right) were Raja (King), Roar, Rocket, and Rani (Queen or Lady). I’m sure when the Sharavathi River would be in full flood during the height of the monsoon, these four constituent parts could blend together into an unimaginably crazy wide and powerful torrent. 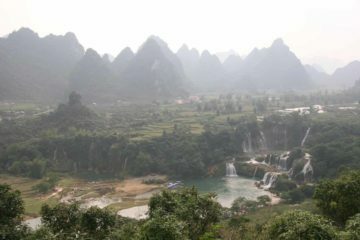 Plus, we also noticed somewhat of an orphan waterfall way to the left of all the action that also appeared to be tall and picturesque (though I suspected it was on a different watercourse than the main river). There was a steep path that descended from the overlooks right down to the plunge pools deep within the depths of the gorge. I was told this walk took about an hour going down but two sweat-drenching hours on the way back up. 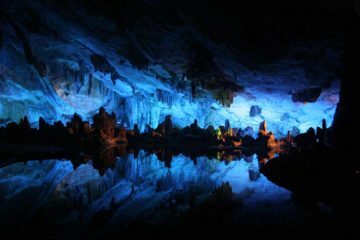 It also seemed like we were supposed to hire a guide in order to get down there (though I wasn’t sure if that was truly the case or if we were potentially being scammed). We didn’t go down there, but apparently we noticed some people way down there swimming to beat the heat. I would also imagine that had we been down there, we could gain a bit of an appreciation of just how big and overwhelming the waterfall could be. 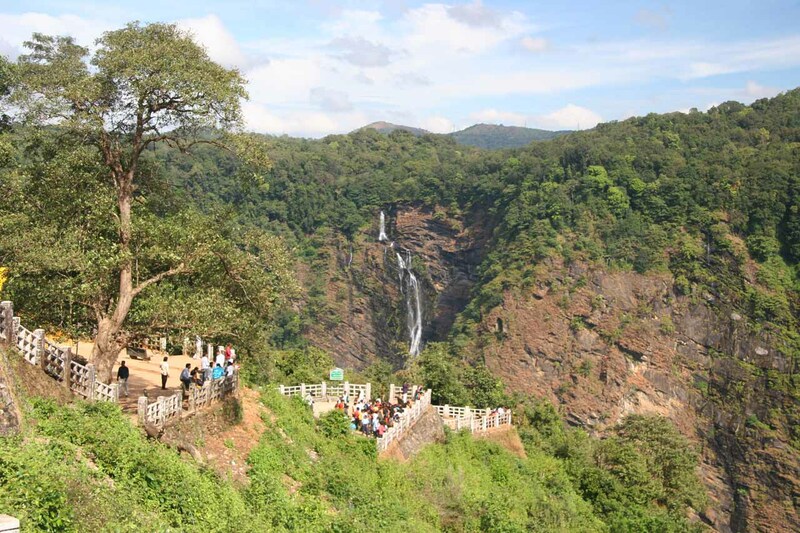 There was extensive infrastructure opposite the gorge of Jog Falls with broad overlooks (and even some with large stadium-like steps) along with a large car park (and unsurprisingly many touts). A separate road also led to the top of the falls, as evidenced by us witnessing other people being dwarfed by the falls in the distance, but we didn’t bother with this option. Finally, in terms of timing, we had observed that perhaps the best time of day to see the falls would be some time in the afternoon when the sun would be more or less behind us. We were here in the morning, but we ended up looking against the harsh frontal lighting that kept most of the falls in shadow while the rest of the scene was bathed in the bright sunlight. All that contrast between light and shadow wreaked havoc on our photos. 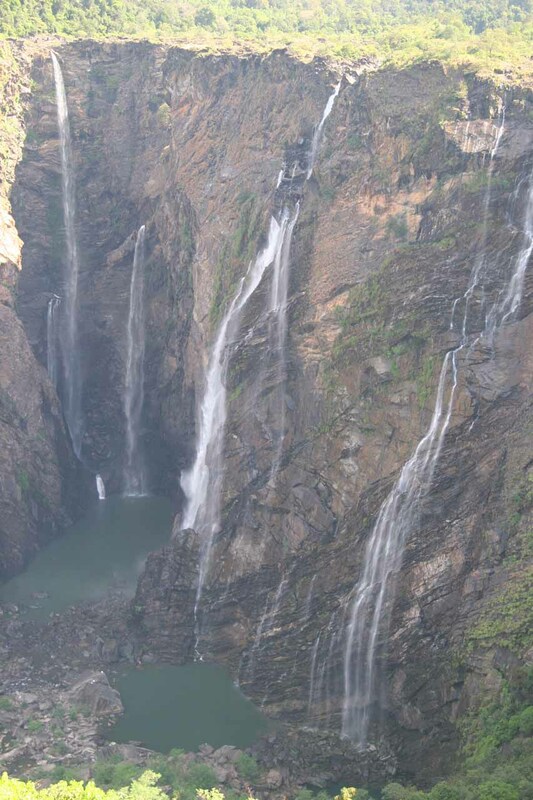 Now before we end the general discussion about the waterfall, we do have to note that this waterfall was frequently said to be India‘s tallest waterfall. 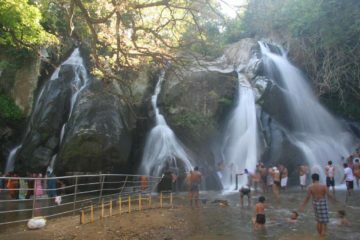 However, we were doubtful of this claim given that other waterfalls were claimed to have taller cumulative heights or direct plunges. 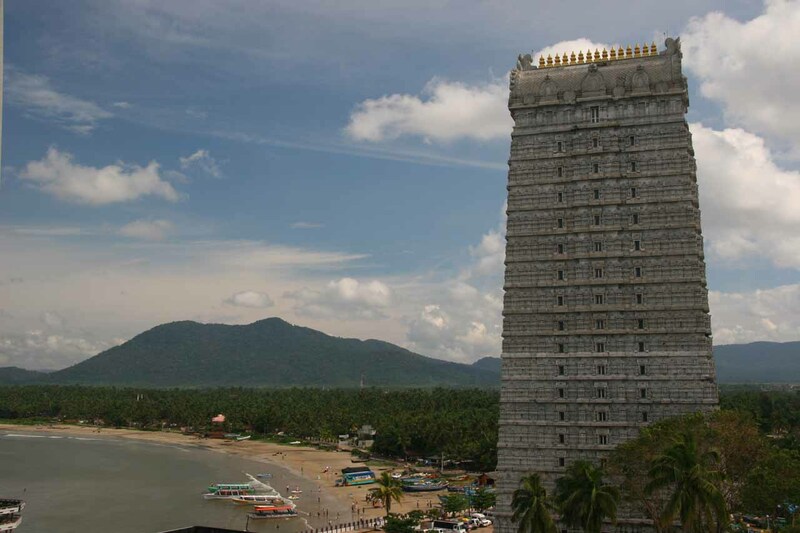 In terms of taller cumulative height, we can think of Dudhsagar Falls (which was claimed to be 300m according to local signage and not 603m as stated in our 2007 version of LP as well as other internet literature propagating the false information). 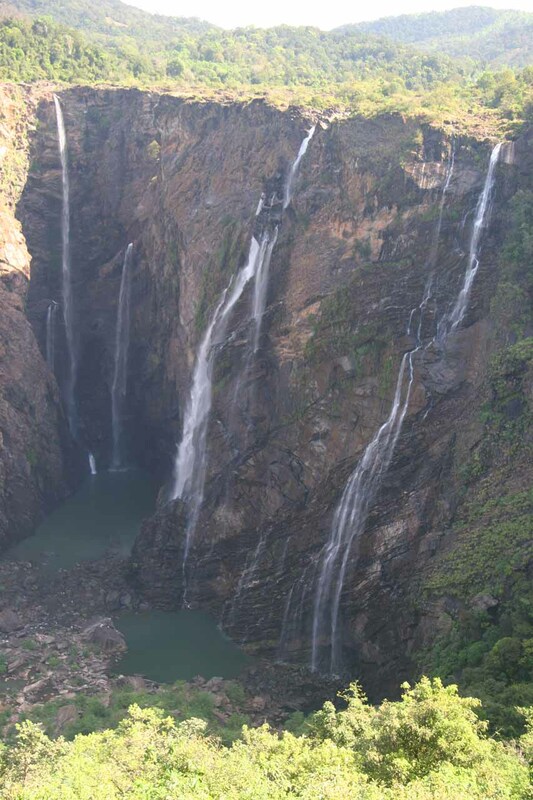 Now if we constrained the argument for only plunge type waterfalls, then it might be possible that tallest in the country could be Nohkalikai Falls provided its unofficial height of 335m wasn’t too generous either. As you can see, all this encyclopedic information contained all sorts of uncertainty. So Julie and I would recommend that rather than worrying about all this trivia, just enjoy the spectacle for what it is and let Nature do the rest. 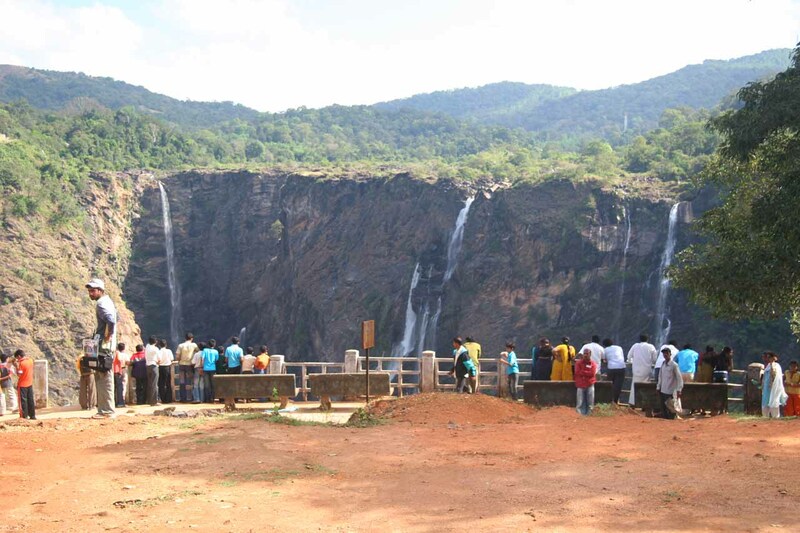 We came to the main car park and overlook area by car from Sirsi some 60km away from Jog Falls on pretty decent road. 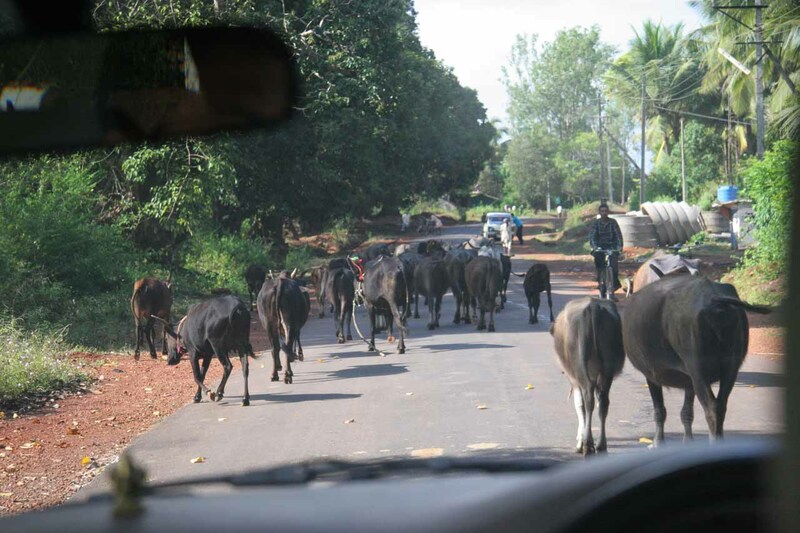 It took us around 75 minutes due to dodging lots of cows as it wound through lots of agricultural land while passing through the town of Siddapur. Note: we hired a driver as you probably wouldn’t want to be self-driving in the country unless you’re very used to the chaotic traffic conditions here. Thus, we can’t give exact directions. 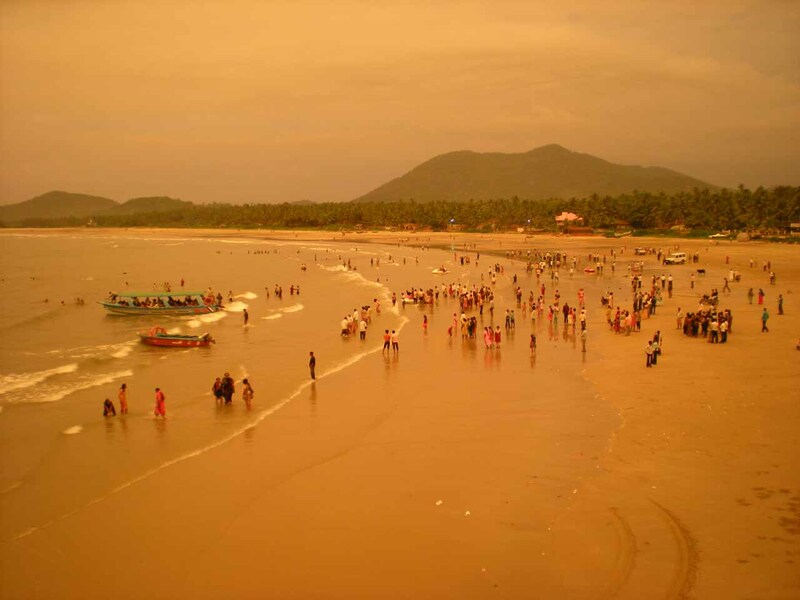 For some context, we flew to Panaji (the main town of Goa) from Mumbai, which took us about an hour to traverse the 579km or so (10 hours drive). 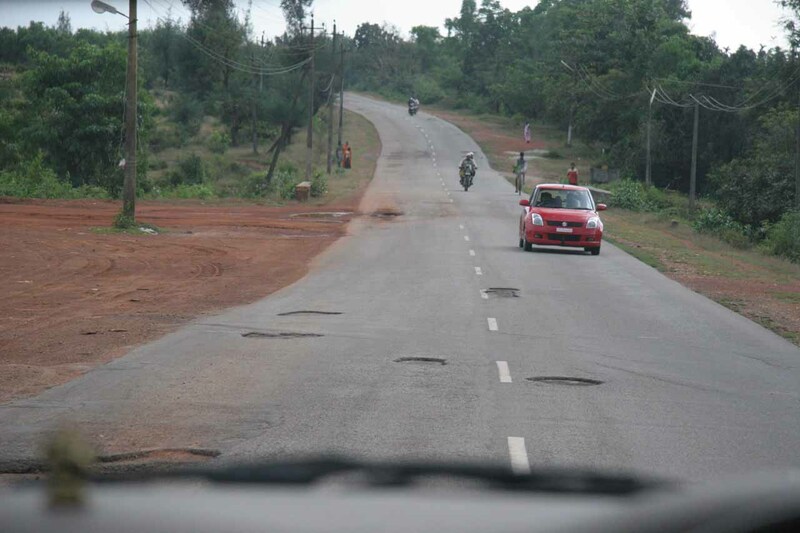 The drive from Panaji to Sirsi would have taken 5 hours to go the 230km. Mumbai was a two-hour flight from Delhi.